Animalic perfumes have always intrigued me but I never had the courage to try them. I was mistakenly convinced that animalic scents were off-limits to the beginning perfumista. It’s too complex, too raw, too dirty, too revolting for the novice nose. Drawing inspiration from her own feline, a gorgeous Russian Blue, Jill McKeever’s perfume description of Winter Kitty piqued my curiosity. The thought of smelling like my cat after she has wandered about in the snow was much too great to resist. The late Jakq. Jill McKeever’s “strange familiar”. Description: Winter Kitty is a botanical perfume inspired by felines, fireplaces, and snowflakes. 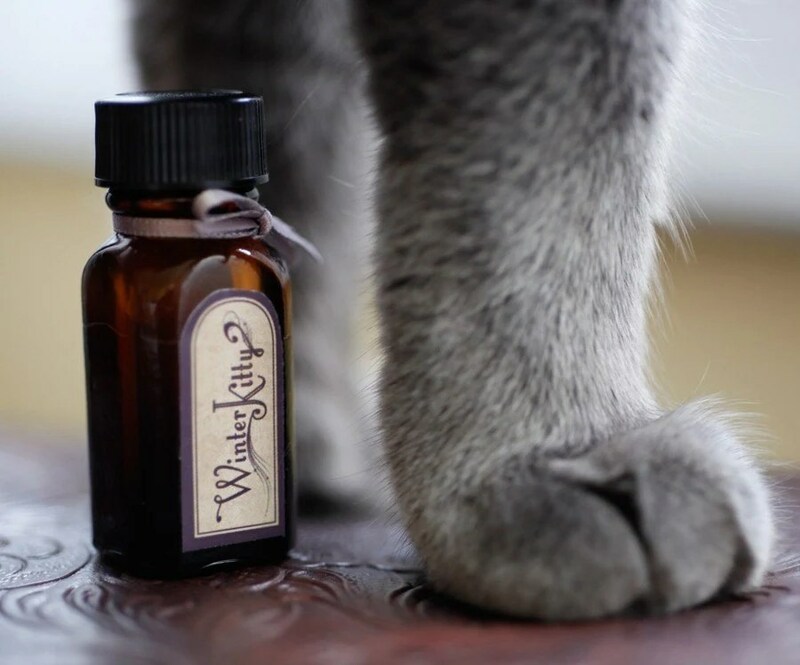 This blend is an artisan rendition of the sweet, slightly musky smelll of a kitty who went out for a winter walk and came back with chimney smoke and brisk air lingering in his fur. From the Vial: Wow! One whiff I can smell very strong mint and douglas fir. I have frost-bitten nostrils. The sensation is much like squeezing fresh wintergreen toothpaste up my nose. (Don’t do this at home, kids.) The smell gives me the imagery of going out into the dead of winter taking a deep yogic breath, filling my lungs with the ice-cold mountain air. With this introduction, I expect an interesting ride. Wet on Skin: The sweetness comes through. As the mint and douglas fir stay in the background, I smell sweet vanilla and a very light, soft smokey musk of cat fur. How is this possible? It smells exactly like my cat. Dry Down: After a few minutes of dry down, a whisper of rose starts to emerge. The Rose gets stronger and stronger as it dries , then the vetiver enters the picture. Makes me wonder where my cat has been. Rolling around grass, rose petals, and pine needles? The scent is simply exquisite. The end of the dry down a stronger smokey frankincense emerges mixing in with the sweet musky vanilla, rose petals, and sharpness of the pine needles. I can see myself sitting in front of a wood burning fireplace and my cat seeking warm refuge from her cold adventure. She purs while I stroke her cold silky fur staining it with my stale sweet rose perfume tainted hands. Sillage: The sillage is poor. I am disappointed since I want the whole world to know how amazing this scent is! I can smell it when my hands are close to my face. But when I’m typing on the computer, for instance, there is no throw at all. Longevity: With application of the perfume enhancing fixative base, it lasts 4 -5 hours. Would I Buy a Full Bottle? Hell, YES! And I will definitely come back for more! Season and Occasion: Winter. This would be a casual daytime scent for me. Final Verdict: Winter Kitty is comforting and sensual. At the same time, clean and fresh. It is a very tactile and visual perfume. You can actually feel the textures, sensations, and see the images that Jill McKeever was trying to convey. Winter Kitty is the epitome of McKeever’s talent for liquid tapestry. She is an alchemic storyteller. She takes you on a scent journey. She challenges your nose as well as your imagination which is what artisanal perfumery is all about. Winter Kitty is one of a kind. Not your run-of-the-mill Bath & Bodyworks fragrance you smell on every other person on the street. If you want to set yourself apart from the mainstream. Wear this.